If a Factory Falls in Bangladesh, Does it Make a Sound? This piece was originally published on Medium. I remember hearing the story of a man who survived 9/11. He raced down the stairs of one of the towers and was in a mall in the basement when things started to collapse—he described the sound of a million tons of steel and concrete roaring down on top of him. Thousands died in that sound. He survived. His story was a tiny, inexplicable point of light in a black day, an asterisk in a book we’d rather give back, a footnote miracle. The larger story is one we all know—a region made turbulent by fundamentalists and oil money, a global network of extremists, a plan that worked horrifically well. It’s a story of terrorism. 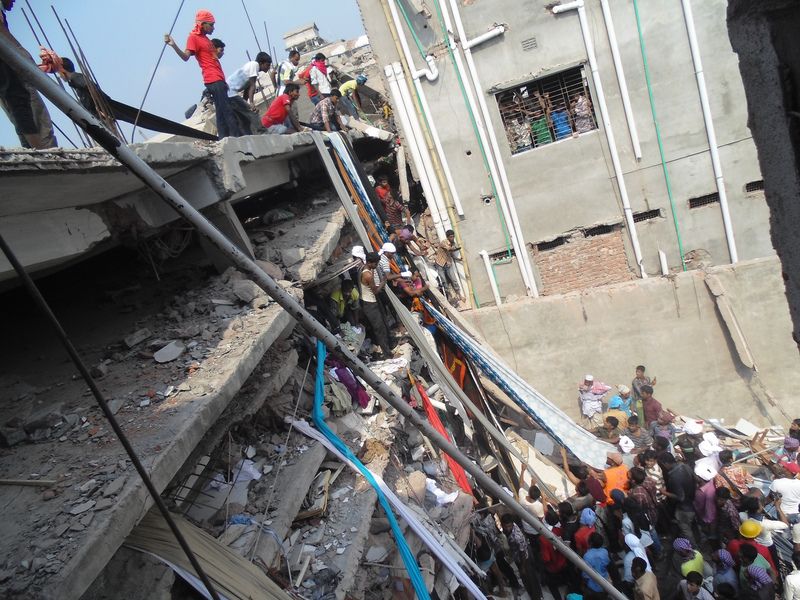 There were footnote miracles in Bangladesh last week after a garment factory collapsed and killed hundreds of the people who make clothes to stock our shelves. Photos show volunteers evacuating survivors on makeshift fabric slides. But the larger story is a building on the brink of crumbling, a country where standards and enforcement are loose, a factory owner competing for the low-margin business of multinational companies, over 1,000 dead, injured, and trapped. This is a story of the global consumer economy. It’s a story, in part, about us. There’s a happy ignorance we bring to our shopping. Walking through a Walmart or a Target or an H&M we know that all these clothes must have been made somewhere, by someone. We know that ours are not the first hands to touch them. But we don’t ask, and the stores don’t tell, and we’re all fine with that arrangement. But without knowing the true stories behind products, we’re more likely to shop on price. And when we opt consistently for lower-cost goods we put pressure on companies to source goods at lower prices, and they put pressure on their suppliers, like the factory owner in Bangladesh, who in turn forgoes building repairs and forces his employees to work even when the walls start to crack. His decisions, of course, are his responsibility. But we have a role in this story. We—each of us agents of the global consumer economy—are the historical force that sets the stage for the play. We are like the New World or King Cotton or Manifest Destiny. We’re a force comprised of a billion little decisions a day. And we each have one big decision to make. We can cover our eyes and let blind market forces trade falling factories for dropping prices. Or we can, slowly through a thousand little, personal steps, figure out a better, more just way of living on this crowded planet. We’ll probably never completely rid the world of factories like that. But I imagine the sound of the Bangladeshi factory collapsing was a lot like the sound of the World Trade Center coming down—the terrible roar of injustice. And for my part, I want no role in making a sound like that.